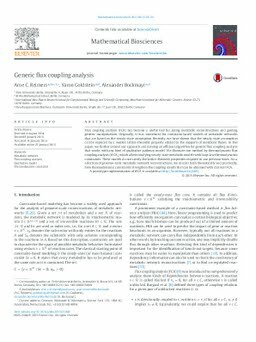 Flux coupling analysis (FCA) has become a useful tool for aiding metabolic reconstructions and guiding genetic manipulations. Originally, it was introduced for constraint-based models of metabolic networks that are based on the steady-state assumption. Recently, we have shown that the steady-state assumption can be replaced by a weaker lattice-theoretic property related to the supports of metabolic fluxes. In this paper, we further extend our approach and develop an efficient algorithm for generic flux coupling analysis that works with any kind of qualitative pathway model. We illustrate our method by thermodynamic flux coupling analysis (tFCA), which allows studying steady-state metabolic models with loop-law thermodynamic constraints. These models do not satisfy the lattice-theoretic properties required in our previous work. For a selection of genome-scale metabolic network reconstructions, we discuss both theoretically and practically, how thermodynamic constraints strengthen the coupling results that can be obtained with classical FCA. A prototype implementation of tFCA is available at http://hoverboard.io/L4FC. Reimers, A.C, Goldstein, Y, & Bockmayr, A. (2015). Generic flux coupling analysis. Mathematical Biosciences, 262, 28–35.